Love is a magical thing, and there's something pretty damn magical in getting to capture a moment of time in it. I really lucked out shooting Courtney and Derek's engagement photos a few weeks ago. For one, they so graciously put up with swarms of mosquitos to explore a new location with me. Two, they brought along my favorite little human bean for some family portraits. And three, they laughed and laughed the entire time; reminding me of just how magical love is (and making my job magically easy). Here are some shots from their family portraits/save the dates/engagement session hybrid. Click them to see them big and on black. I'd always been one of those "let's do all the shoots in all the natures" photographers. That is, until I began working as a Studio Manager at the gorgeous West Studios in the Heights. Watching artist after artist use the space in unique ways to tell their story made me itch to try for myself, and after a bit of play on my own, I finally felt comfortable using the space for a "real" shoot. 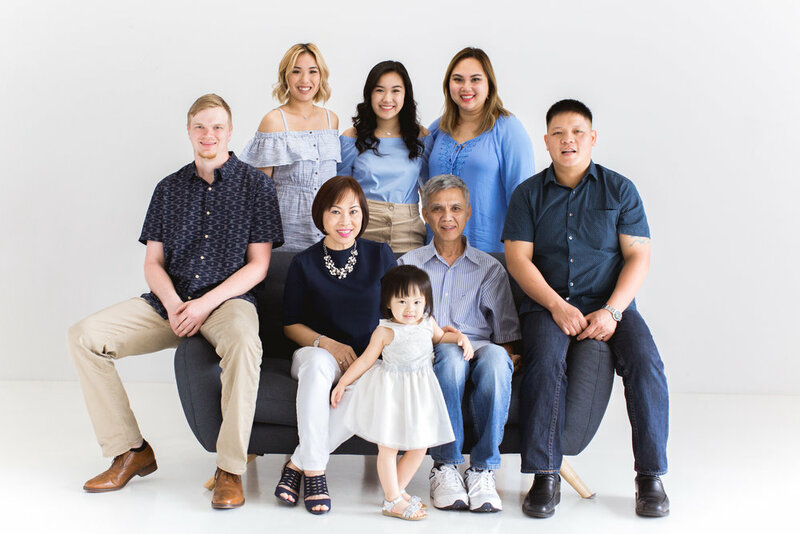 When Truc reached out to me to shoot her family portraits over Easter weekend, I knew the light and airy nature of the studio would be a perfect fit. It rained all morning; the skies only clearing in the minutes before they arrived. And in true Houston fashion, it became a humid nightmare shortly after. But inside The West Studios we stayed cool, dry, and comfortable. Check out some of the images from my session with the Nguyens below (click 'em to see 'em big). If you're interested in booking a session with me at the studio, click here to shoot me a message!